Tiu Teja Waterfall located in the forest of Santong village, sub Kayangan, North Lombok regency, West Nusa Tenggara Province. Tiu Teja waterfall consists of two adjoining waterfall, but in the dry season only seen one waterfall alone. This waterfall has a height of approximately 40 meters. The width of Tiu Teja approximately 10 meters. Around the waterfall there are still beautiful greenery. Under the waterfall there is a 1.2-meter-deep pond which then flows into a larger river. The named of Tiu Teja itself inspired from Sasak language which means rainbow. Visitors who came to witness the beauty of the rainbow colors of waterfall due to refraction of light colors are so beautiful rainbow tub. Visitors who come here are also free for swimming, keeping in the depth of the pool under the waterfall is only 1.2 meters, but for the children, still need supervision. The routes to the waterfall is quite challenging, visitors must go into the woods and past the swamp cooler first. Field path to the waterfall is slippery rocky dirt road in the rainy season and can not be skipped car. It is not advisable to drive a car if you want to go to the waterfall, because visitors have to walk to go on far enough. If a visitor came by motorcycle, visitors have to walk as far as 100-200 meters from the car park and then bike down the path that eventually ended up in Tiu Teja waterfall. 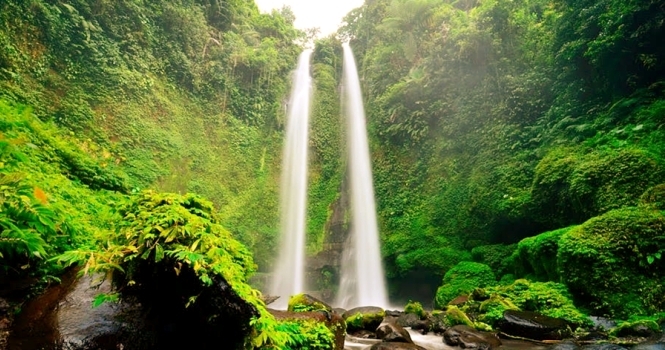 From Bangsal harbor in Pemenang village, North Lombok to the waterfall location is approximately - / + 30 km, whereas from the capital city of Mataram within - / + 60 km with a travel time of about 1 hours drive using a two-wheeler or four wheels at normal speed between 60/75 km / h.